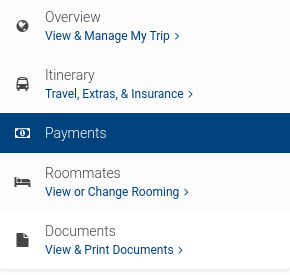 You can see a full price breakdown on your online profile under My Trips and the Payments section. Here you will see the price breakdown for your travel package and any additional purchases, as well as your Payment History and Payment Dates. Travel Package: Includes transportation, accommodations, on-site staff, hotel security, daily events and activities. Activity Package: If you have purchased extra excursions or night events, the cost will be listed under this section. Tax: These taxes and fees are comprised of but not limited to: airport & airline imposed taxes & fees, tourism tax, transportation tax, federal inspection fees, and government imposed taxes. Total: Add the above prices together and this is your final trip cost. Activity Package, Insurance and Extras: The cost of the included excursions and medical insurance. If you purchase the extra insurance or excursions, the amount will show here too. Total: Add the above and this is your final trip cost. *Please be advised that your trip details may vary. View details on your trip page by entering the trip code provided by your trip organizer, or by viewing them after you have signed up on My Profile.